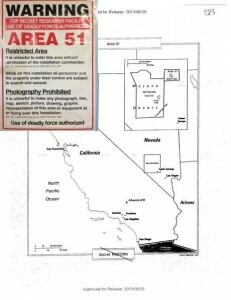 CIA has admitted for the first time that Area 51 exists by officially acknowledging it by name in a document released through the Freedom of Information Act. Major media networks today gave wide coverage to the CIA admission that Area 51 is real. The CIA document was released to Jeffrey Richelson, a Senior Fellow at the National Security Archive, George Washington University who requested further information on the history of the U-2 Spy Plane. In the document, the CIA acknowledges that Area 51 was chosen due to the suitability of the Groom Lake dry sand flat for testing secret spy planes. What the CIA document didn’t mention was another dry lake bed nearby, Papoose Lake, which is only 12 miles away. According to whistleblowers, this is the location of an even more secretive facility called S-4 where a variety of saucer shaped spacecraft are tested and reverse engineered. This is the facility named by Bob Lazar in 1989 who briefly worked there, and disclosed all to George Knapp in a series of interviews for Las Vegas television station KLAS. 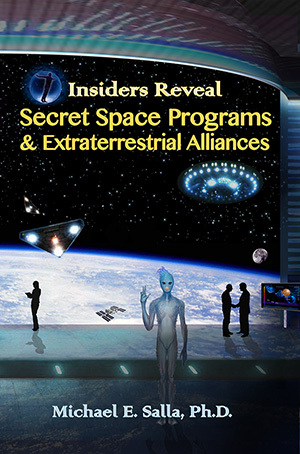 S-4 is where you will find alien spacecraft and even live extraterrestrials according to Lazar and other whistleblowers. … marks an end of official secrecy about the facts of Area 51. It opens up the possibility that future accounts of this and other aerial projects will be less redacted, more fully explained in terms of their presence in Area 51. What Richelson doesn’t mention, along with the authors of the CIA document, is another facility nearby at Papoose Lake. This is where the whistleblower Bob Lazar claims to have been taken after flying to Area 51 from Las Vegas on a JANET flight – an air shuttle for Area 51 workers. Lazar claims to have personally seen up to nine different flying saucer type craft, some of which were alien in origin. Lazar worked on the propulsion system and was paid by an unacknowledged branch of the US Navy called the Department of Naval Intelligence. Lazar eventually decided to go public, and become a whistleblower. His interviews with George Knapp from KLAS-TV became world famous, and put Area 51 on the map for UFO investigators. More recently, in May 2013, a retired CIA agent going by the pseudonym ‘Kewper’ gave video testimony before six retired members of the US Congress about an incident involving President Eisenhower requesting information and access to the S-4 facility in 1958. 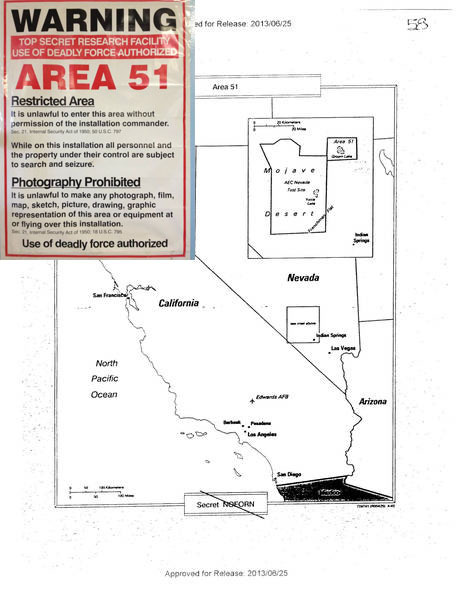 It appears that in the three years or so since the building of Area 51 and the adjacent S-4 facility, that the managers of S-4 decided to withhold information about what was happening there. Eisenhower had to threaten to invade S-4 with the US First Army before its managers decided to share classified information with him. According to the CIA agent, the S-4 facility housed a number of extraterrestrial space vehicles along with a captured live alien that he personally saw. His CIA boss, along with other agents, even got to directly interview the live alien. In 1997, a whistleblower using the pseudonym Victor, released a video of a live alien being interviewed at S-4. 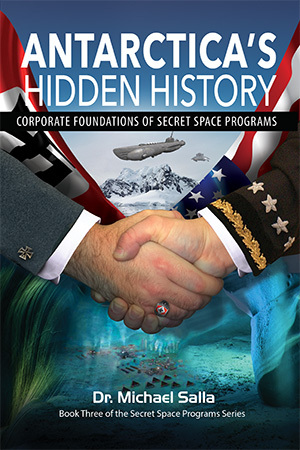 The official acknowledgement by the CIA that Area 51 exists is welcome advance in getting the CIA to release information about secret aviation projects near Groom Lake. However, the testimony by Lazar, Kewper and others suggests that Area 51 is not where the most classified projects take place. Area 51 is a convenient cover for even more secretive advanced aviation programs housed at S-4 at the nearby Papoose Lake. The CIA is only telling a half-truth that you won’t find any extraterrestrial technologies or alien beings at Area 51 according to Lazar and others. It is at the nearby S-4 facility next to Papoose Lake where alien spacecraft and their pilots can be found. ← Alien interview video: hoax or real thing?